Hybrid Racing Shifter Cables - Pann Auto Performance - San Diego largest aftermarket automotive performance parts - What do you drive? The HR cables feature stainless steel push rods, swivel support tubes, and inner cables. The rod ends and mounting bushings are all 6061 aluminum that have received a T6 heat treatment and a black, hard anodized coating. Also, a new rubber grommet is included for replacing the OEM grommet. The HR cables are designed to be upgraded replacements for the OEM cables. The solid rod ends and bushings give the Hybrid Racing cables a firmer, tighter feel over OEM cables. In addition, the plastic swivel support tubes that are known to break on the OEM cables have been replaced with stainless steel swivel support tubes, which are significantly harder to break and these cables are 30% thicker. We wanted to give people a peace of mind when they shift hard and during demanding racing applications. The Hybrid Racing shifter cables are slightly thicker than OEM cables. We include a new rubber grommet that goes around the OEM cables so you will not have to re-use your OEM one. It should be noted that the OEM cable that is controlled by the right/left motion of the shifter has a plastic twist-lock bushing on the shifter end. Hybrid Racing cables instead use a spring clip and aluminum bushing. This aluminum bushing simplifies installation a bit, but more importantly, it gets rid of yet another plastic part that tends to flex on the OEM cables, leading to a sloppy feeling shift. 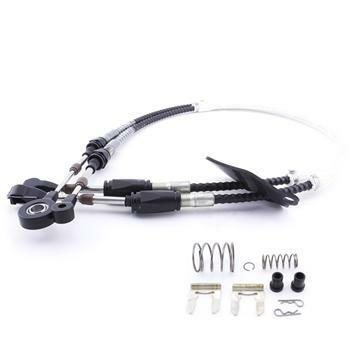 The extra spring clip that you will need to install the Hybrid Racing cables is included with the cables, so you will not need to buy any other parts. An easy to follow installation tips sheet is included with each set of cables to make instillation as worry free as possible. Aside from 2 shifter cables, each shifter cable set includes 2 cotter pins, clips for the shifter end, and transmission selector lever springs. Each set also comes with a new rubber grommet for the hole in your fire wall. The install guide is below to give you a step by step guide to make the install as easy as possible for you.